For thousands of years now, the inhabitants of the Mediterranean countries have cultivated the olive tree and used its products for their daily needs. The edible olives and oil were used in their food, the leaves and the oil had therapeutic powers or were used as incense and the oil was also used as an offering to the gods. What is an olive? The olive is a drupe, a fruit with a fleshy skin enclosing a stone and either circular or oval in shape. Olive oil is the natural juice of the olive, a pure product which is obtained with machinery or by natural means. The oil of the olive is found in the pericarp, the fleshy part of the fruit. When did the olive tree first appear? 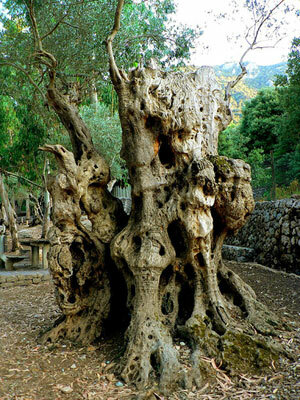 The tree, indigenous to the Mediterranean Sea, seems to have been around for thousands of years. A fossilized leaf of the olea noti family has been found at Kyme on Euboea, while evidence that proves the scattered spreading out of the tree has been found in Provence in France and in the countries of Northern Africa. Now hear this: this old piece of evidence originates from Santorini and Nisyros, where Professor Evangelos Velitzelos discovered fossilized olive tree leaves aged fifty to sixty thousand years old! Of course, most of the evidence that has been found until today does not go as back as this. 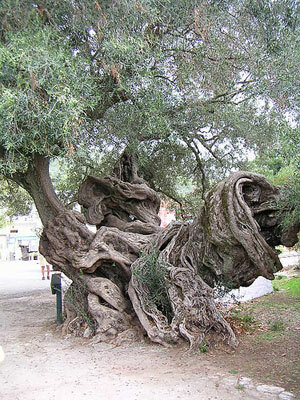 Nonetheless, there's been evidence from Crete in the 3rd millennium BC about the use of edible olives and olive oil. 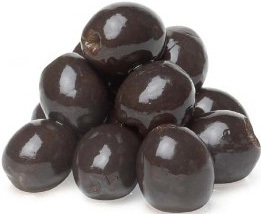 There have been found stones of edible olives next to human remains dating from before 1500 BC. There have been found olives and olive oil in ideograms, like the ones you can see in the pictures. There has been found evidence (through chemical analysis) that the Minoans used olive oil in cooking. See, olives and olive oil have been a huge part of every Mediterranean civilization's everyday life. 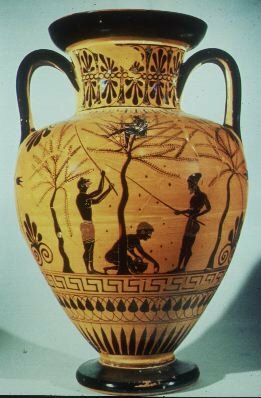 Even the Olympic Games can prove as much: the custom of awarding the winner with a branch from the holy olive tree that was planted in Olympia by Heracles (not the famous son of Zeus) is a good enough indicator. Olives are the fruits of the olive tree which is indigenous to the Mediterranean countries but also cultivated nowadays in other areas, even in America and Australia. There are many different kinds of olives. Some are used only for making oil, while others are for eating, usually the ones larger in size. Then there are also some varieties used for both oil and consumption. The tree blossoms in spring (April-May) and shortly afterwards, the olive fruit start to grows. They are a bright green color in the beginning; this lasts until the point when they ripen. This point varies amongst the different types of olive but usually it is around the end of autumn. So, let's start with how olive oil can be used.